We were up at 0730 to a beautiful sunny morning. I could just hear Dave, VE2EDB, and the TPN but WB5NHH came on with a CQ and managed a contact in CW and that ended any possible contact with anyone in Canada. One Canadian station was quite loud and if he could have copied CW I would have been able to say I done did it again. Oh well, such is life. Joan was trying hard to send Natasha an e-mail this morning but could not get it to work. Karen had given us two passwords to use. We can bring up six sites but cannot get into any of them. Only the one is labelled the Canton RV Park. 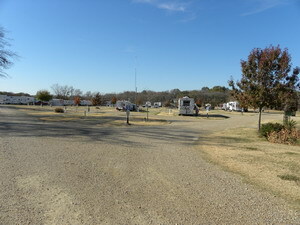 This appears to be a new campground and is so nice we would have been tempted to stay an extra day or two with e-mail. It seems I spend all my time driving and trying to update this web site. I enjoy both very much but it leaves little time for anything else like ham radio. 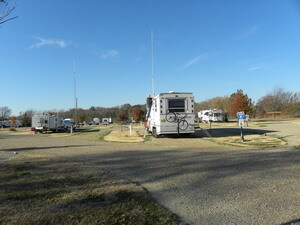 It adds quite a bit to the set-up and take-down when we include ham radio. This is a photo of me taking the bolt out of the stand-off insulator on the HF antenna. Putting that up and taking it down includes folding and unfolding the ladder. 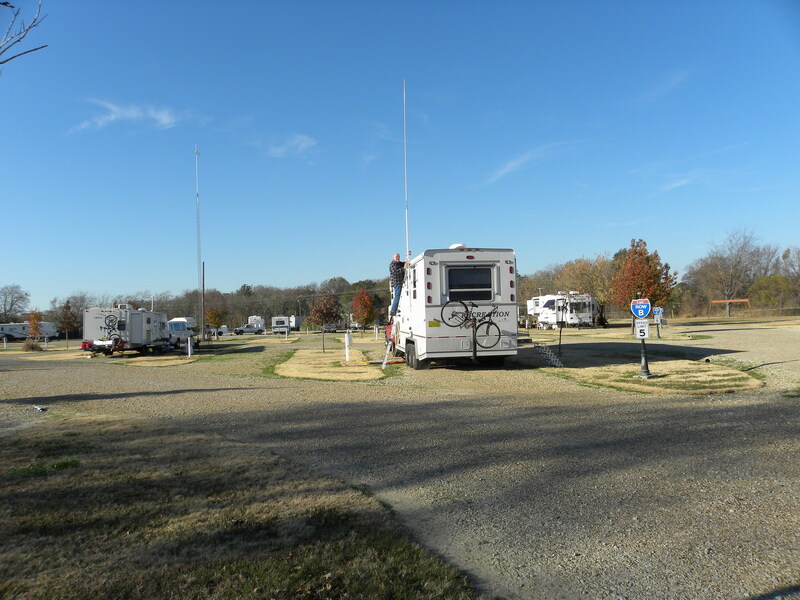 This was taken at the Canton RV Park before we left this morning. I managed a chat with Stan, KZ8G, only and had to cut him off to give Joan a hand. Hopefully I will have a lot of time for ham radio once anchored in Arizona. 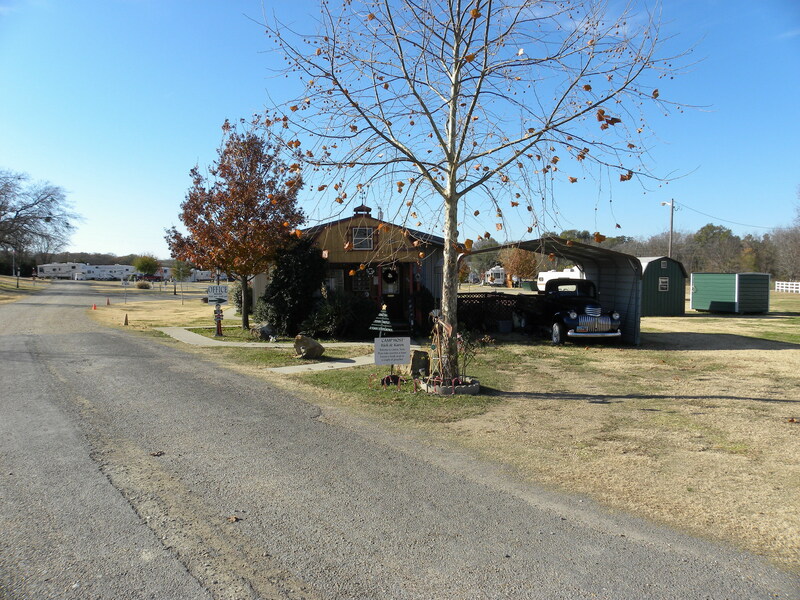 This is a photo of the Canton RV Park. The trailer to the left of ours had many dogs. Some were not small. One was a full size poodle and another I would call a Russian Wolf Hound until I see a photo of one to prove me wrong. Karen had a nice sweet Border Collie that loved to come around and meet everyone including the other dogs. But this one I call a Russian Wolf Hound was determined to give the Border Collie a hard time. Thank goodness the owner had it on a short lead. They were on their way to Jackson, Mississippi, to a dog show and found our trailer very interesting. While listening to my description you could tell they would have loved to have one like it built with their dogs in mind. Note the big goose asleep under the no swimming sign. When we left Joan tried to get a photo of it. It was up at the time but by the time she managed to get the camera and get out of the truck she could not find it. So she took a photo of the Duck Crossing sign instead. 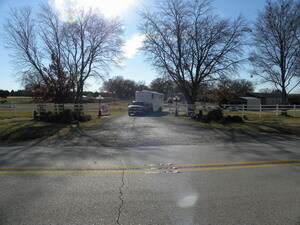 Joan then walked to the other side of the road and took a photo of our rig leaving the campground main gate. We managed to get everything stowed and departed Canton RV Park at Wills Point, Texas at 1011 this morning. We drove 214 kilometres and pulled into the Gilbert Pit Road Rest Area at 1227. We walked around a little and I managed to clean the windshield and then we drove another 65 kilometres and stopped for diesel. This was at Love's Travel Stops, a truck stop with lots of 18-wheelers parked, coming, going and what have you. This was a bit different. I had to pay for $70.00 of diesel, go pump the diesel and then go get the receipt that had already been printed. It was the receipt this time and not my credit card. We felt it rather weird to say the least. Even so one hell of an unfriendly way to do business. 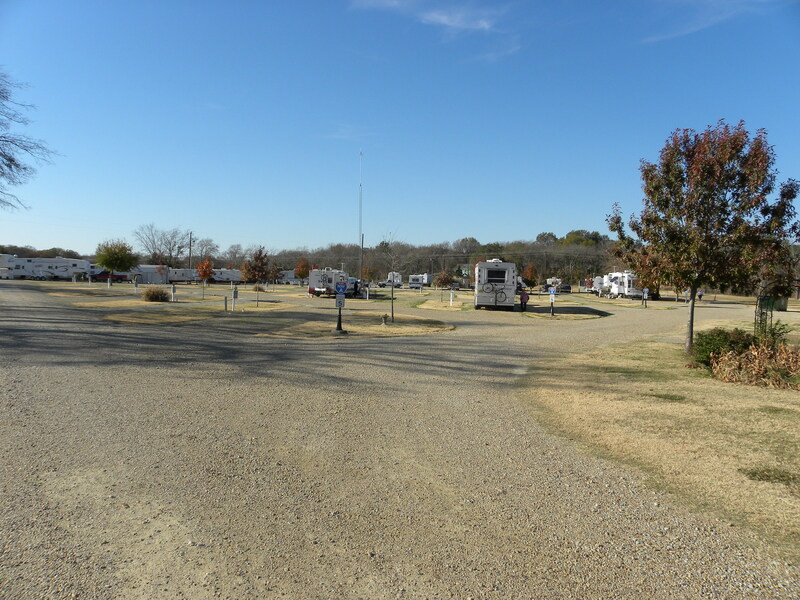 After the diesel we drove another 93 kilometres and pulled into the Abilene RV Park at Abilene, Texas. Heat and e-mail finally. Joan had the windows of the trailer open and even peeled her sweater off. 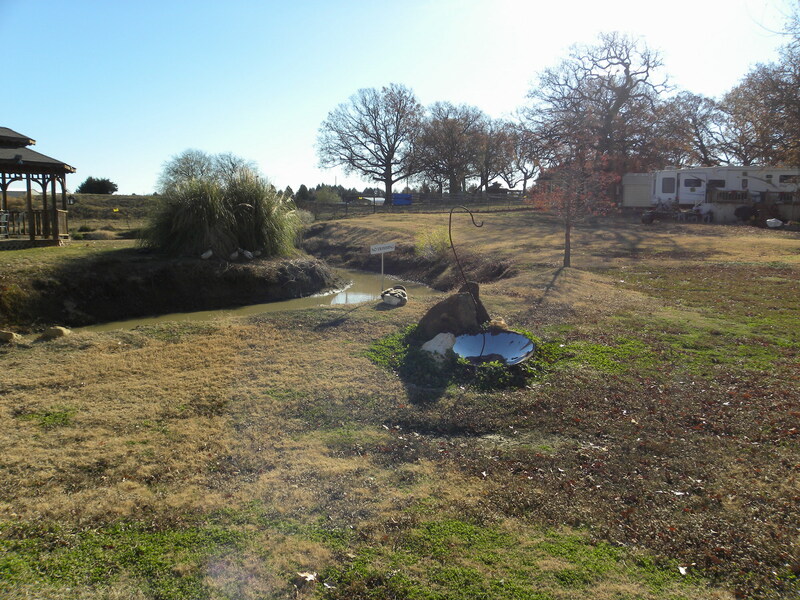 It was 51F when we left Wills Point and 74F when we arrived at Abilene. It kept getting warmer as we came west. A beautiful warm sunny day a lot like a day in July back home in Nova Scotia. Now that we have e-mail we have been trying to catch up on everything. It was awful good to hear from everyone. If I had this trip to do over I would wait until I got home to describe it. Transmitting everything, especially the photographs is very time consuming. We have a long way to go with hills before us. We managed to make 372 kilometres today.